Are'nt things fun, yesterday I said that I should post earlier and yea I was going to, until I realized that internet didn't work. The reason was that someone accidently had damaged the main internet cable while working on something, appearently a large area of mostly northen sweden was affected. Now it's back as you understand. Yesterday I also said that I'd show a post for my where in the world challenge but I figured since is Wednesday and I've already have a bunch of green in the archive I might as well show that first, and tomorrow I'll do a challenge post. And as usual it's Green Wednesday at Vacker&Underbar. 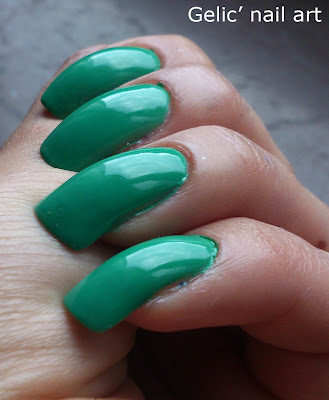 The green I'm showing today I've bought from a woman in a facebook group I'm in, she had bought a bunch of polishes in Thailand (I'd so love to go there!!) and afterwards realized that she didn't need all of them. 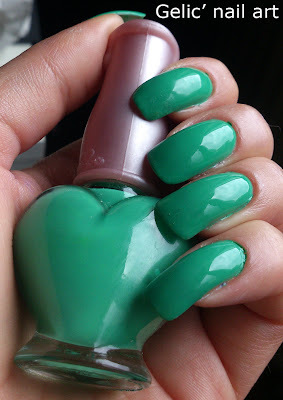 Since I love green, I bought a "green bag of unknown greens" for a cheap price and this heart-bottled green one below is one of them. As you can see from the pictures it's a green towards blue and it's a creme and the formula was awesome! It went on like butter, I didn't need to do any clean up and pictures show 2 coats. It has no brand name, name or number but I suspect that it could be something from Etude House since the cap is used by them. Or what do you think? Ja flaskan är riktigt söt och dessutom gillade jag att den var så överraskande trevlig att lacka med. Eg trur kanskje det er ein Etude House-lakk, ja - han ser nett ut som ei flaske eg har frå EH. Fin grön. Härligt med positiva appliceringsöverraskningar sådär! Gullig flaska och färgen den var riktigt fin! Söt flaska och fin färg! Ja viss är det! Hoppas du kryat på dig, läste att du varit till akuten. I love when you comment my posts even if it's just a simple hello. To simplify I will answer the comments in the post you wrote them in. I'll answer all comments so please check back if you want. :) Have a nice day! 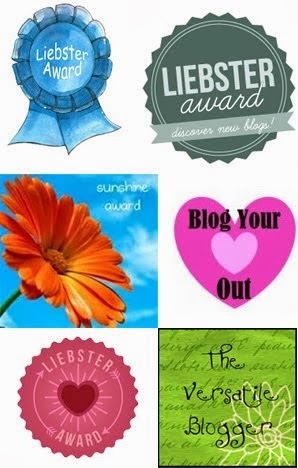 Blog Your Heart Out Award Nomination! All pictures/text are mine unless otherwise stated. Pictures/text can be borrowed if you link back to me and the actual post the picture/text appeared in. No one like a stealing sob. 3 = Nice, in the middle.."lagom"
You can find them as labels/ key words in each post and in the left side. 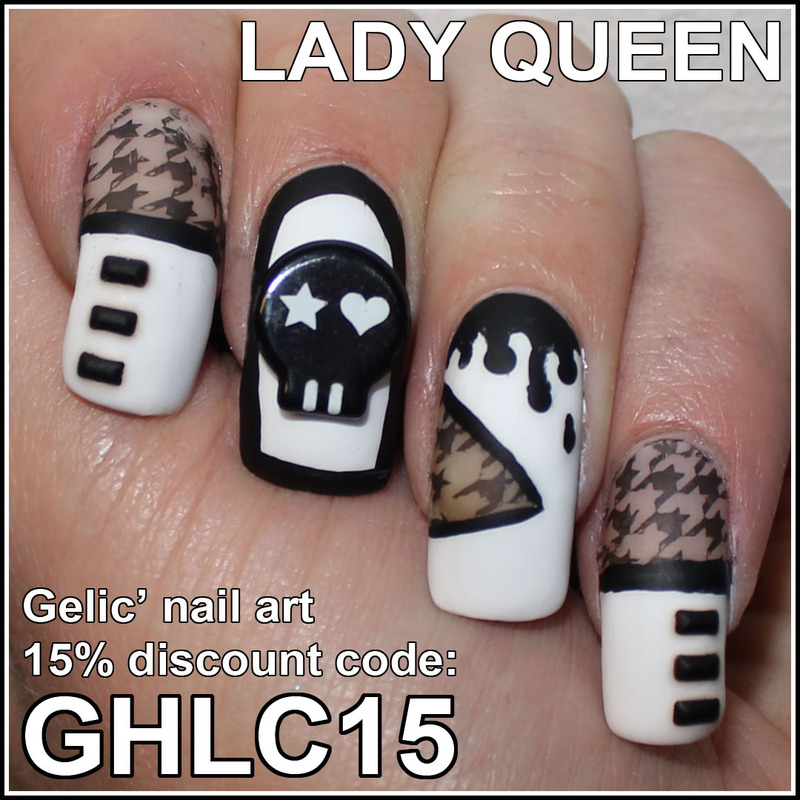 Nails and all that jazz.